If you're in the market for a wood floor in a low-traffic room, don't ignore the rustic charm and extremely low cost of softwoods like pine. Trees are classified as either hardwood or softwood according to the structure of their seeds. And while almost all hardwoods are, in fact, hard, softwoods are not really soft; they’re simply more susceptible to dents and dings. Impervious to such incidental damage, durable hardwoods have become virtually synonymous with wood flooring. And it’s undeniable that for high-traffic rooms, particularly in homes with children or pets, hardwood makes the superior floor choice. 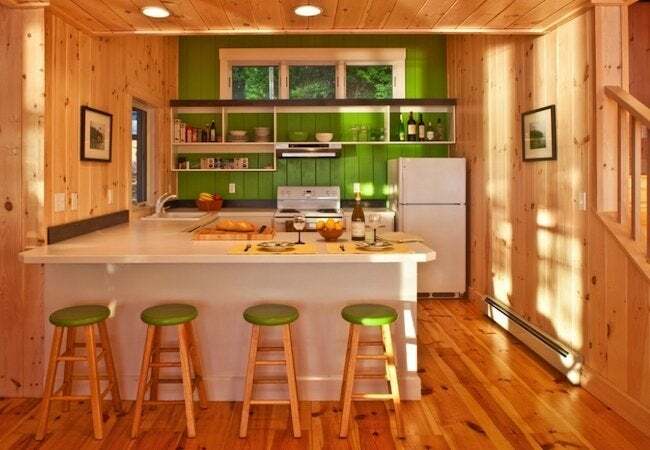 But due to their low cost and rustic look, there are certain situations in which softwoods—pine, spruce, and fir, for example—might be used effectively as flooring. While the many varieties of hardwoods spoil homeowners with choice, softwoods encompass a category unto themselves. Pine is probably the softwood most frequently used in flooring, but it’s not the only one. Fir, cypress, cedar, spruce, and hemlock are other commonly available softwoods, and you will find additional options that are unique to your geographical region. Best of all, no matter which softwood you choose, it’s bound to cost less than any hardwood. For example, you can typically get pine for half the cost of oak, perhaps the most ubiquitous hardwood flooring material. And many cases, pine costs even less than vinyl flooring! Besides affordability, another reason to like softwoods is that they’re more environmentally friendly than slower-growing hardwoods. Because many types of softwood grow quite quickly, they lend themselves to sustainable farming and harvesting. Like bamboo, softwoods can be considered a renewable resource. There are degrees of resiliency among softwoods, but it can be generally stated that in comparison with hardwoods, softwoods are more vulnerable to dents, dings, and scratches. In a kitchen where canned goods might fall from a countertop, or in a living room where the floor might be subject to a guest’s high heels, softwoods would inevitably—and sooner rather than later—begin to show wear. That said, the durability of a floor depends not only the species of wood from which it’s made, but also on its finish. If you stain a softwood floor and then seal it properly with a few applications of polyurethane, chances are it’s going to stand up fairly well. In a room with only a modest amount of activity—a finished attic, for example—softwood flooring could be expected to last for many years. Some folks don’t even see dents and dings as imperfections, but rather as valuable contributions to the character of a floor. 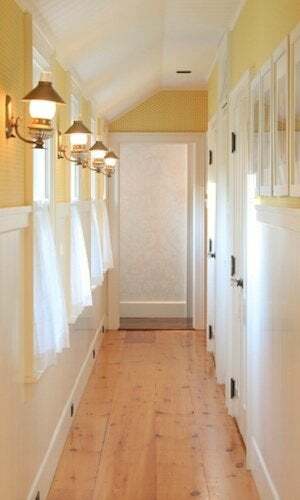 Such homeowners might even purposely distress or antique a new floor, wanting it to look older than it really is. Those whose style preferences run to the rough and rugged may very well find pine more desirable than a highly resilient hardwood like hickory. If you walk into the flooring section of your local home center, you might not actually find any softwood floors for sale. Except for certain types of pine, softwoods are rarely marketed as flooring products. For the best deals, inquire at a nearby sawmill or lumberyard. Know that for any softwood species, there are different grades of quality. Grades 1 and 2 are most suitable for flooring, though you can save even more money by choosing a lower-grade wood, if you can live with, and love, the knottier material. If you want to conceal the nails that secure the floor, purchase boards with tongue-and-groove edges. Whereas hardwood floors often come prefinished, softwood hardly ever does. That can be a good thing, though, since it affords you the opportunity to finish the wood exactly as you’d like. There are lots of options when it comes to finishing, including stains, varnish, and tung oil. Or, if you like the natural look, you can always leave the wood unfinished—after all, that’s how people did it for hundreds of years. To avoid problems with moisture, however, it’s recommended that you apply multiple coats of polyurethane, lightly sanding between each coat. After all, even though you’re paying considerably less for a softwood floor, you’re not going to save any money if you need to replace it right away!